Wild jubilation broke out among MPs and on the streets of Zimbabwe when Mudenda told the House. The 93-year-old Mugabe president resigned in a letter he submitted to parliament hours after his party and Zimbabwe’s ruling party, Zanu-PF, presented a motion to impeach him. 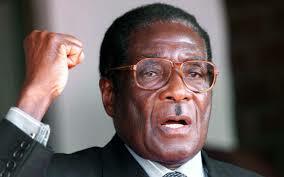 Mugabe had been accused of allowing his wife Grace, 52, hijack power and being too old to rule. The Parliament’s leader said he was working on legal issues that would enable vice president, Emmerson ‘The Crocodile’ Mnangagwa, to take over within 48 hours. Mugabe’s sudden downfall lies in rivalry between members of Zimbabwe’s ruling elite over who will succeed him, rather than popular protests against his rule by the people. The army seized power after Mugabe sacked Mnangagwa, the ruling party’s favourite to succeed him. The move was perceived as a path to the presidency for his wife, who is widely hated for her lavish lifestyle report says.